2Wheel Chick: Reed Court Farm - bumpy furrows suitable for all ! Reed Court Farm - bumpy furrows suitable for all ! 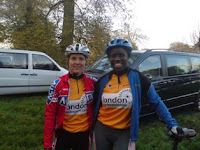 Reed Court Farm played host to Round 7 of the London Cyclocross League last Sunday. Last year was the first time this event was being staged here. My recollections of the event then were firstly of how technically easy the course was, and secondly the difficulty of finding the venue - which probably led to the unfortunate incident in which Jody Crawforth (Evans RT) leading the pack, collided head-on with a belated rider, Rebecca Stubbs (CC Giro) while she was hurrying to the start. This time I was a little more familiar with the route to get there, even if I was still a little short on time. The organisers had changed the lay-out to avoid a collision (though not all were convinced this was an improvement on last year). Jody Crawforth was there again with his Evans team mates, though Rebecca wasn't. As for the course - well, it hadn't changed, but something had changed in me. With a course that essentially ran around the perimeter of farm fields plus a few tight switchbacks through the odd bit of woodland, this made for something largely untechnical. In fact, last year I found it a joy to ride - no worries about riding up steep banks or tackling fearsome descents. Nothing especially muddy - even the single-track was pretty wide. So really there was nothing to it - just a bumpy Sunday ride around the fields. Great course for any beginner. However, what made the difference for me this year was that I actually raced it. My mountain bike had been swapped for a cross bike, my smiley face was replaced by a grimace - ready for fierce competition - as I powered my way around the course on the big ring. My pulse rate was close to the red most of the way round, and all my faculties were channeled into riding as fast as I could - no senses to do much else. That will explain why I was thrown off my bike in the start/finish area after failing to see the muddy mound, and the bike suddenly skidded. The medics wanted to stop me and check that I was okay, but in those states it's difficult to stop anyone when they are forging ahead with a one-track mind ! At the end of the race my lungs were burning and I was coughing and panting for several minutes afterwards. I began to realise what people meant when they'd been saying last year that this was a hard course. It's not just how technical a course is that makes it hard. It's also down to how energy sapping it is. Riding over dried bumpy furrows at speed, at times with a head wind to contend with, and negotiating an uphill drag is extremely taxing. 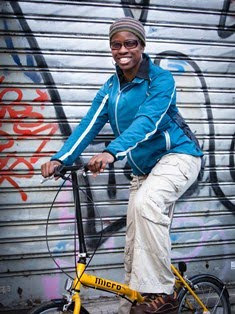 The body burns calories upon calories just rolling over every bump and keeping a smooth action on a fast moving bicycle. What the course doesn't request of you in technical know-how, it more than demands from you in speed and power ! And I was glad to have taken on this challenge. On balance, this is more my type of course, and the result showed this as I crossed the line right behind Katharine Mason (Sussex Nomads) who is normally streets ahead of me. I would still say that this is a good course for beginners as it isn't technical and the paths are wide enough to allow for easy overtaking by the lead riders. The rankings have not been published yet, but it'll be no surprise to see Nicky Hughes (Activ Cycles) as the league leader. I might be in second place, but it'll be by a long way - I don't think Nicky will be troubled ! Still, it's good to have a standard to aim for.